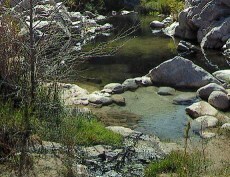 The Bureau of Land Management (BLM), in coordination with the California Historic Route 66 Association (CHR66A) will prepare a corridor management plan (CMP) for the segment of the historic Route 66 within the BLM California Desert District that extends from the western city limits of Barstow, California to the Colorado River. Thursday, February 27: Needles High School cafeteria, 1600 Washington Street, Needles, CA 92363. In addition to the two public meetings, a one hour California Route 66 Webinar will be held Thursday, February 27, at 1 p.m. (Pacific Standard Time, GMT-08:00) to provide additional opportunity to participate for those unable to make the meetings in person. The meeting will be hosted by Lardner-Klein, the CMP contractor. For information to join the web meeting, please go to: http://www.route66ca.org and follow the link. The web-based meeting is best viewed from a personal computer, but does not require a password. Members of the public also may call the toll-free number (US/Canada) at 1-855-244-8681 to listen to the presentation. Written and oral public comments will be accepted during the public scoping meetings. Written comments also may be submitted by mail to Lardner/Klein Landscape Architects, 815 North Royal Street, Suite 200, Attn: Route 66 CMP, Alexandria, VA, 22314, or email at cart66cmp@lardnerklein.com. Comments must be received no later than 30 days after the last public scoping meeting. Additional opportunities for public participation and formal comment will occur upon publication of the draft. An ad hoc corridor management plan committee is being formed to provide advice to the planning team throughout the planning process. To have your name added to the mailing list for notification of the web-based meeting, scoping meetings or subsequent outreach, please submit contact information (name, address, email) to Lardner-Klein at the above email address. The CMP will provide for the long-term management, protection and promotion of Route 66, and the preservation and conservation of the adjacent BLM National Conservation Lands/public lands. The Plan also will include a comprehensive interpretive, tourism and marketing strategy to promote sustainable heritage tourism in an effort to provide economic benefits to communities and local businesses. The BLM worked closely with the CHR66A and California Preservation Foundation to write a proposal for a U.S. Department of Transportation, Federal Highway Administration grant to fund preparation of a the CMP. The BLM received a $153,500 grant in August 2012. Upon completion of the CMP, the BLM will submit a nomination to the Secretary of the Department of Transportation for consideration to designate the California segment of Route 66 a National Scenic Byway. Route 66 was designated a national highway in 1926, and extends 2,448 miles across eight states from Chicago, IL to Santa Monica, California. CMP planning process: Jim Klein, Principal, Lardner-Klein, (800) 337-1370; cart66cmp@lardnerklein.com;.